UTech, Jamaica Innovators Shine at 2016 National Medal for Science, Technology and Innovation Awards — UTech, Ja. 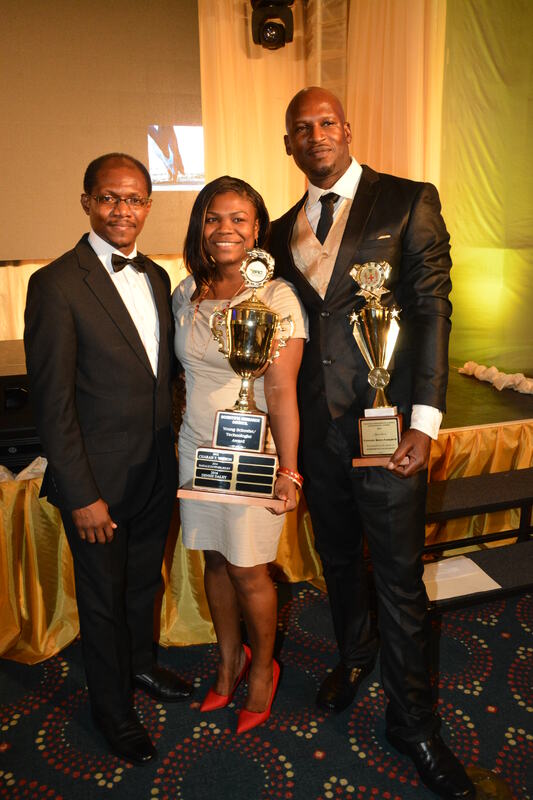 UTech, Jamaica Innovators Dr. Denise Daley (centre) Programme Leader and Lecturer, Complementary and Alternate Medicine and Herbal Studies in the School of Allied Health and Wellness, College of Health Sciences and Mr Ceretsie Rowe-Campbell, Lecturer, School of Hospitality and Tourism Management (SHTM), College of Business and Management pose with their trophies awarded for their respective innovations at the National Medal for Science, Technology and Innovation Awards held November 16, 2016 at the Jamaica Pegasus Hotel, Kingston. Acting President, Prof. Colin Gyles (left) shares in the happy occasion. The University of Technology, Jamaica shares in extending heartiest congratulations to members of the University community who were awarded for their research innovations at the National Medal for Technology and Innovation Awards hosted by the Scientific Research Council (SRC) on Wednesday, November 16, 2016 at the Jamaica Pegasus Hotel. Dr. Denise Daley, Programme Leader and Lecturer, Complementary and Alternate Medicine and Herbal Studies in the School of Allied Health and Wellness, College of Health Sciences, won the Young Scientist/Technologist Award “for the creativity and innovativeness of her research work submitted, its potential social and economic value, its potential for supporting national development, evidence of peer-reviewed publications,” and her oral presentation at the Science and Technology Conference titled “Development of functional foods and nutraceuticals from hypoglycemic and hypotensive compounds isolated from Eucalytus Camaldulensis”. Mr. Ceretsie Rowe-Campbell, Lecturer, School of Hospitality and Tourism Management (SHTM), College of Business and Management shared a tied award with Mr Paul Jackson, School of Engineering graduate, UTech, Ja. in the Environmental Sustainability category. Mr Rowe-Campbell’s entry was an indigenous Sustainable Food Carte (Kitchen) that utilises wood for cooking. Mr Jackson’s entry, an Environment Focus Recycling Machine, is a shredder of waste materials (e.g. coconut husks, plastic, market spoilage) of which the output can be used as compost. Congratulations also to Dr. the Hon Henry Lowe, OJ Adjunct Distinguished Professor of Ethno-Medicinal Chemistry, College of Health Sciences who was the winner in the Health and Safety category and who also emerged overall winner with his entry, the Alpha Prostate Formula II, first product of its kind formulated with the Jamaican Ball Moss extract and isolate HLBT-001, the major bioactive ingredient in the product. The predecessor to Alpha Prostate Formula II is Alpha Prostate Formula I, a nutraceutical supplement used in the management of prostate health. Alpha Prostate Formula II is formulated with the single molecule from the Ball Moss which has been identified to possess anticancer activity against breast and prostate cancer. The product has shown significant bioactivity against the previously mentioned cancer cells and negligible toxicity against normal cells. The product also promotes good prostate health. Prof. the Hon. Errol Morrison, OJ, former President, UTech, Jamaica was awarded the National Medal of Science and Technology. This special honour is bestowed by the Prime Minister on Jamaicans who have made outstanding contributions in Natural and Applied Sciences including Engineering. The recipient is an individual whose work has resulted in significant advances in the field of science and technology and/or whose technological innovations have contributed significantly to the economic, cultural and social development of the nation since Jamaica’s Independence. The national medal award by the Government of Jamaica is intended to highlight the importance of fostering applications of science and technology in order to promote national development. The Innovations Award in Science and Technology celebrates outstanding achievements in innovations, while promoting the application of science and technology and innovation personal and national growth. It is held every two years. In 2014 the event was re-branded as The National Medal for Science and Technology and Innovation Awards Ceremony. The major goals of the National Medal for Science and Technology and Innovation Awards are to sensitize, stimulate and encourage stakeholders – individuals, students, communities and organizations – to use science and technology in their endeavours, ultimately creating an enabling environment for innovation and creativity. The awards also seek to celebrate outstanding achievements of innovators in science and technology and ultimately to increase production, productivity and diversity of products. Heartiest Congratulations to all winners.